This is Nigella's Pear and Chocolate Pudding. It comes from the Storecupboard S.O.S. chapter of Nigella Express, which comprises, naturally, recipes that can be made primarily with ingredients that can be kept in the pantry and can thus be made at a moment's notice. This particular pudding contains the usual storecupboard suspects - flour, cocoa, sugar, butter etc. - and some tinned pears. I'm not in the habit of keeping tinned pears on hand, but after seeing the delicious photo in the book, I thought I'd better start. 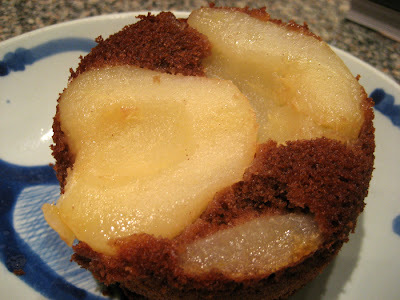 The recipe involves placing tinned pears in the bottom of a large buttered baking dish, covering them with a chocolate cake batter (all done in the food processor), and baking until it becomes a gooey, crusty, fabulous pudding. It serves 6-8. I made it on a night after work when 3 of us were eating, and thought I'd better halve the recipe so that I wouldn't inhale the entire thing in one go. As a result of this uncharacteristic portion control, I made the puddings in individual 250ml ramekins, with 2 pears per portion. Tinned pears are surprisingly small and cute! I served them (as you can see in the first photo), with vanilla ice-cream, and the hot chocolate sauce that accompanies the flourless chocolate brownies in the Workday Winners chapter. 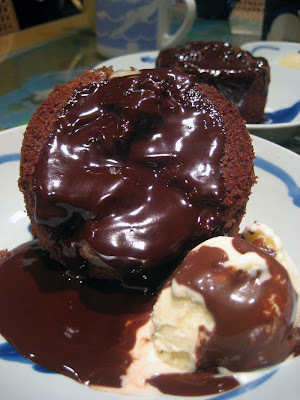 (You may recall that I didn't make the sauce when I made those brownies, and I had been regretting it ever since.) It turned out to be a good move - it turned out that I overbaked the puddings slightly, and the sauce rescued them from dryness. But don't let that mislead you; the entire combination was absolutely heavenly. It looked divine when Nigella made it and yours does too. I'm definitely buying htis book soon, I had it in my hands yesterday but thought I would wait for a sale so put in back, wonder how long before I cave & just buy it? The chocolate sauce helped a lot! These look adorable! Hoorah for the humble tinned pear. Yum, this is definitely on my list of things to make from NE. i'll give you a stumble upon thumbs up for now! hi, i was looking for this pear and chocolate pudding. can i have the recipe in full? Cooked it tonight - DELICIOUS! can't wait for tomorrow when I get some icecream for the leftovers!